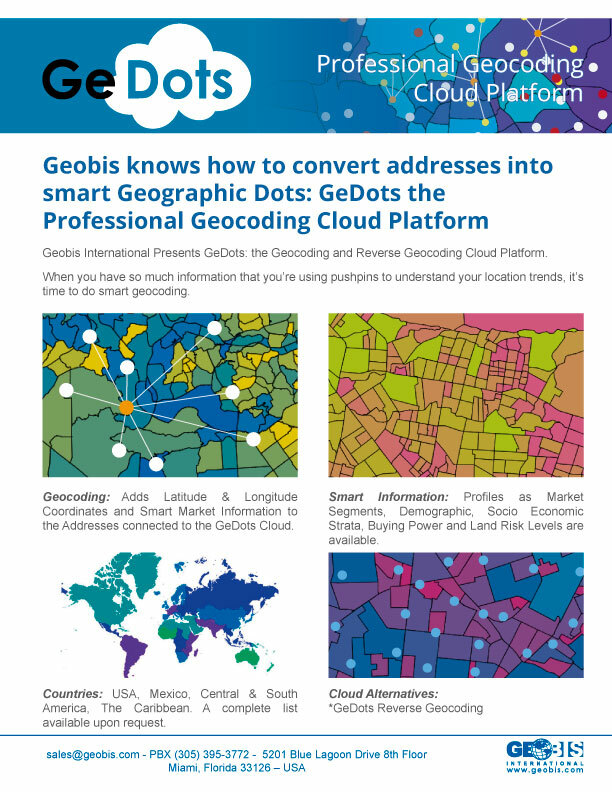 Geobis Knows how to convert addressed into Smart Geographic Dots. Use your customer databases and transform it in to valuable geographic information with this Professional Cloud Engine. » Gets the original address and performs a normalization for fast dictionary coordinates search. » Address data aggregation: ZIP code, market segments, socio economic strata SES, Geo demographic Profiles, Buying Power, others. 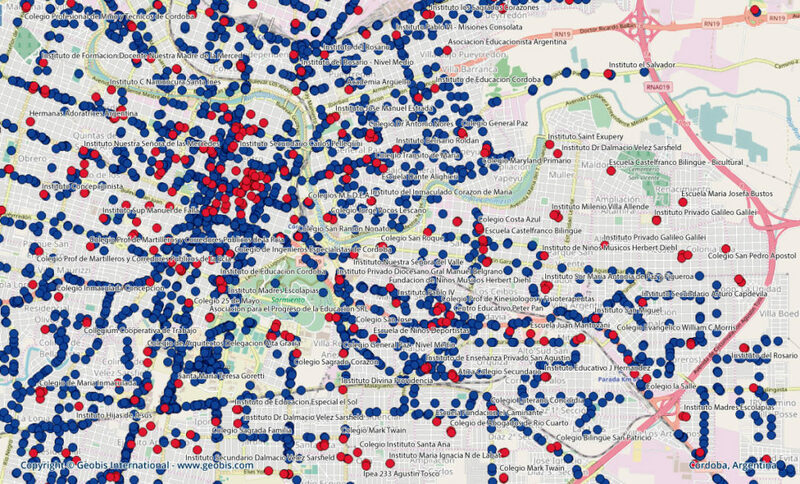 » If is being used though any mapping platform, points can be drawn on digital maps. GeDots web services can be requested from different environments such us Web Enable Platforms, Intranets, PCs, Tables and Smartphones. How is Geocoding done with Gedots? » Take the original addresses and standardize them by arranging them in a coordinate dictionary for a faster search. » Find and provide the Latitude and Longitude corresponding to each direction. » It complements data by providing only the address, for example: ZIP code, market segments, SES socioeconomic stratum, Geodemographic profiles, purchasing power, among others. 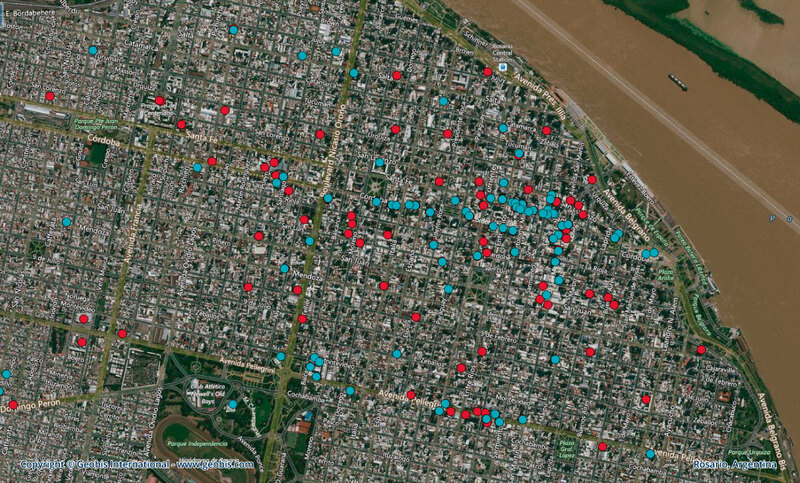 » If used across any mapping platform, points can be drawn on the created digital maps. » Add smart information to your dots as: zip code, market segments, demography, socio economic strata, buying power and land risk levels. » Source code available for programming proprietary designs. » Permanent enrichment of local country address and Points of Interest POIs dictionaries. » | Address | Latitude & Longitude | data aggregation is available under request: ZIP code, Strata, Geo demographic Profiles, Buying Power, others. » Complex algorithms help to decryption of the natural ways addresses are written in different ways, allowing address matching into national and local dictionaries. » Always online for processing individual records. When your information is enough for starting to understand your location trends and handling pushpins, it’s time for doing geocoding. Through this process, you can: 1. Enrich a location described by adding smart Information and Latitude & Longitude coordinates to your addresses. 2. Locate addresses (your POS addresses, customer addresses even the addresses of competition) over the earth’s surface for a better data visualization. » Adding profiles as ZIP code, market segments, demography, socioeconomic strata, buying power, expenditure scores and land risk levels is available under request. GeDots has a large list of countries in which you can perform Geocoding processes, such as: USA, Mexico, Central America, South America and the Caribbean. More about countrie Digital Maps.